Whenever you watch movies envisioning the future, there are usually technological innovations, such as flying cars, robots, jet packs, holograms and virtual reality simulators. Although that’s not the future we are necessarily in, Drexel students have some of that technology at the touch of their fingertips thanks to Drexel University Antoinette Westphal College of Media Arts & Design. Drexel University’s new Immersive Research Lab aims to give students and researchers the opportunity to use the latest augmented reality and virtual reality technologies for study, exploration and application. Located in Westphal’s URBN Center, the 550-square-foot, glass-enclosed lab contains computers and workstations, such as Mac Pro Workstations, HP-ZVR Backpack Workstations and MSI laptops. 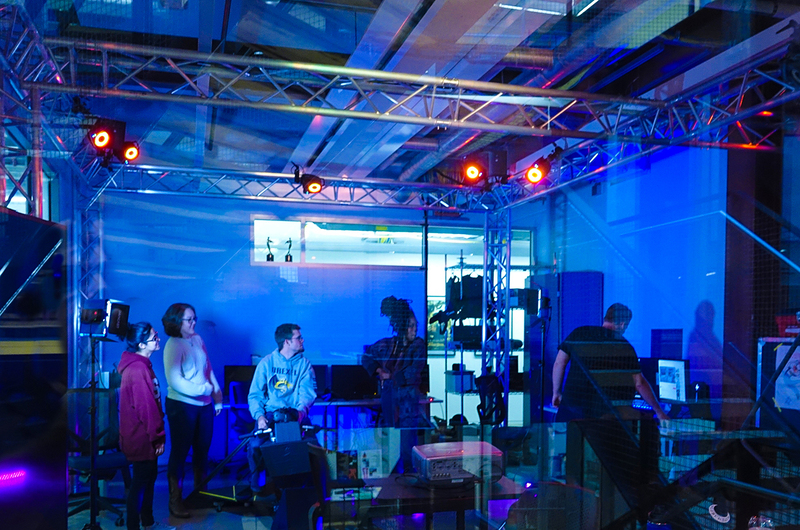 For detailed recording of movement, the Immersive Research Lab also features Leap Motion hand-tracking, iClone facial motion capture system and a full motion capture studio with OptiTrack and Vicon motion capture systems. For students who want to see what celebrities like Wiz Khalifa, Jonah Hill and Adam Levine are seeing in the Oculus Go commercials, this lab is home to the Oculus VR and Oculus Go VR Headset systems, along with other AR and VR devices, such as the HTC VIVE and Microsoft HoloLens headsets. The lab’s 360-degree virtual reality cameras, holographic displays, screening rooms, stereo and mono display screens, Ambisonic sound system, 16-foot diameter fulldome projection screen and LED systems provide students with the most realistic virtual experience possible. “If you have even the smallest inkling of an idea that involves immersive media and AR/VR, this lab will give you the tools and expertise to explore it and test it out,” Jushchyshyn said. The Immersive Research Lab has already successfully allowed students to produce projects like a fully interactive 360 degree gigapixel touch-based display of garments by the designer James Galanos. A fully ride-able VR “Motorcycle system,” and an animated reconstruction of the titanosaur Dreadnoughtus schrani have also come out of the lab. Jushchyshyn plans for AR and VR and immersive media to continue production with the development of the Immersive Research Lab. He plans to build a graduate program, which will enroll its first students in the fall of 2019. The program will focus on exposure to the most up-to-date AR and VR technology and software, and allow students to gain and apply experience in the field through Drexel’s co-op program. “This technology, which allows us to experience our world, and others, in new and exciting ways, is the new reality,” Jushchyshyn said.